Donnie Darko is back in cinemas today, over fifteen years after its first release. Here’s hoping that second time’s a charm for this cult hit that never quite lived up to its box office potential. Timing is everything, especially in this movie. Time, time travel, and the manipulation of time are welcomed into the movie and treated as protagonists. In fact, the concept of time travel acts as the deus ex machina for the plot, creating the wormhole which allows Donnie to meet his new friend Frank and reset time at the very end of the movie. Time is a theme elsewhere as well. Richard Kelly created a period universe, a loving homage to the 1980s teen dramas and Stephen King & Steven Spielberg movies that he was inspired by. Carefully evoking the style, setting, atmosphere, and sounds of the period, he created a fragile world in which the viewer can seek refuge. By casting 1980s superstars Drew Barrymore and Patrick Swayze in pivotal supporting roles, he went one step further. We can’t help but see the major influence Donnie Darko was on the recent Netflix 80s-inspired smash, Stranger Things. Timing not only affects the narrative of the movie, it also played a huge part in the poor response to the film’s initial theatrical release. Scheduled to open less than a month after the 9/11 attacks, promotion was meager, with executives fearing the film’s plane accident was a little too rich for the population’s blood at the time. In a recent interview with Quartz, Richard Kelly stated, “My movies will take place either on the eve of an election, or in the aftermath of an election.” This device effectively timestamps the narrative in a unique place and time. It’s hard not to make a wormhole of our own between the time depicted in the movie and the current American climate following the 2016 U.S. presidential election. Casting sociopolitical commentary aside, we believe the main reason Donnie Darko maintains its vitality through today is due to the universal themes central to its story. 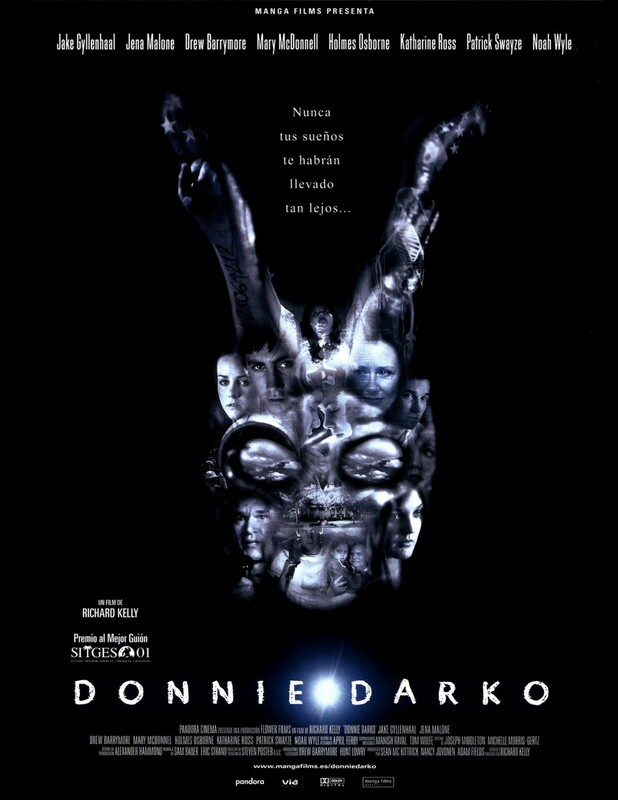 Some may interpret Donnie Darko as a dark spin on the gospel of Christianity for the millennial generation, with the fictional book The Philosophy of Time Travel (by “Roberta Sparrow”) acting as a scripture of sorts. What themes could be more universal than the end of the world and one man’s quest to save humanity? By adding coming-of-age themes to a yen for lost youth and innocence, Donnie Darko presents a narrative that speaks to the human condition. Everyone experiences adolescence, love, and loss, and no one wants the world to end. By telling these tales with wit and wisdom, Kelly created a truly transgenerational narrative. With its clever art direction and solid acting, Donnie Darko feels just as fresh today as when it was first released in cinemas. As Grandma Death says, “Every living creature on Earth dies alone.” We think it’s high time Donnie Darko was resurrected. Find out where Donnie Darko is playing here.